The Onkyo BD-SP807 is one of the first Blu-ray players bestowed with the THX badge. It leaves the edge-cutting to the big boys and focuses on delivering pin-sharp pictures and scintillating sound. Onkyo has used high quality components and boulder-like build quality. Its robust bodywork is topped off by an elegant, brushed black aluminium fascia that gracefully curls forward at the bottom. Buttons are minimal, while the display is large and easy to read. 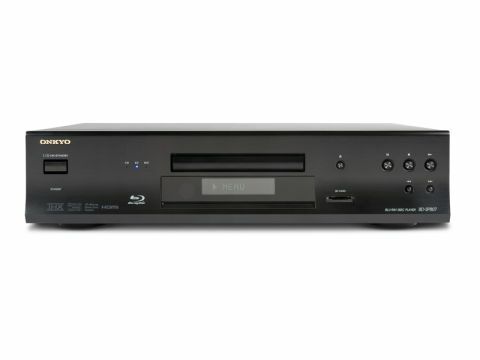 The BD-SP807 is a Profile 2.0 player, and as such can access BD Live web content through its Ethernet port, but Onkyo's single-minded desire to offer the best possible picture and sound quality leaves no room for the sort of Wi-Fi wizardry and PC streaming found on the latest players from Panasonic, LG and Sony. Third party manufacturers such as Onkyo don't have the resources to invest in features like these, but the fact remains that you get a lot more for your money from the bigger brands. Also missing is built-in memory for BD Live downloads, which Onkyo says was left out because of the constraints it would place on performance. This means that you'll need to fork out extra cash for a 1GB SD card, although on the plus side, you can also use it to play AVCHD, MP3 and JPEG files. The player will also play DivX HD from discs, which is a nice bonus. You get all the core features you'd expect from a player whose main purpose is movie playback. For example, 1080/24p output is present as is DVD upscaling to 1080p, courtesy of Anchor Bay's superb ABT1030 chip, no less. The Source Direct mode outputs video without any tampering, plus the deck can also fire HD audio bitstreams to your amp via HDMI, or decode and output them from the 7.1-channel analogue outputs. The BD-SP807 has a pleasant onscreen design, with a setup menu that's split into Quick and Custom menus. Options for optimising the audio output and tweaking the all-important HDMI settings are easy to find and react instantly to remote commands. A separate menu can be accessed during playback by pressing the Mode button. It enables you to fiddle with the colour, contrast, brightness, sharpness and gamma correction settings as the movie plays and stores the results in five memory positions. This is handy for making presets that account for different viewing conditions or the demands of different displays. While the remote control's layout is sensible and well labelled, its flimsy and non-descript design is not what you'd expect to accompany such a pricey player. Another area where the Onkyo falls short of the bigger brands is disc loading time. It takes just under two minutes to start Terminator Salvation, which is frustratingly slow in anyone's book – so if you're an impatient sort then we recommend looking at an LG or Samsung player. The Onkyo more than compensates with its superb picture performance, and it's not hard to see why it gets the THX seal of approval. Their tests ensure that the player's deinterlacing, upscaling, colour accuracy, contrast and black/white reproduction are all up to scratch, and to our eyes it does a fantastic job in each of these areas. With Transformers: Revenge of the Fallen, the image is scalpel-sharp and bursting with bright, natural colours – or as natural as colours can look in a Michael Bay movie. The glinting silver bodywork of those CG robots looks tantalisingly clean, and the deck handles delicate shading with the subtlety you'd expect for the money. But of course it's detail retrieval that really sells a Blu-ray player and that's here in spades. The Onkyo digs out the finest minutiae and textures, giving the picture satisfying depth, which is helped along by pure, untainted blacks and a wide contrast range. It's a dab hand with DVDs too, dragging our copy of King Kong into the high-definition age with the same sharpness and freedom from artefacts that you expect from a dedicated high-end DVD player. Here's where the Onkyo really distinguishes itself from the budget pack. The use of high-quality audio components and that sturdy, vibration-free bodywork result in remarkably sweet, detailed music playback and more importantly, breathtaking reproduction of HD movie soundtracks through the multi-channel analogue outputs. Anyone looking for a beautifully made player that offers excellent picture and sound quality will consider the BD-SP807 money well spent, despite it's relatively lofty price tag. That THX badge will be a major hook to home cinema die-hards, and even as a Blu-ray/DVD spinner it's a terrific proposition. But others might find the Onkyo's lack of added extras, such as wireless support, network streaming and built-in memory a tad unreasonable at this price, particularly when you can pick up a player that has it all for around half the price of this deck.